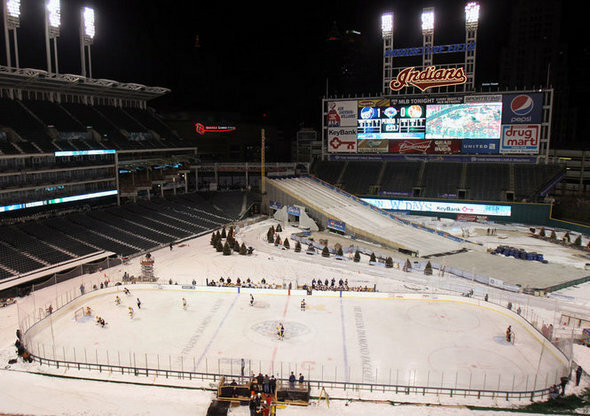 Posted on Fri, Jan 13, 2012 : 12:14 p.m.
High school teams play on the ice rink at Progressive Field in Cleveland, where Michigan will face Ohio State in Sunday's Frozen Diamond Faceoff. The No. 15 Michigan hockey team is taking on CCHA-leading and No. 2-ranked Ohio State this weekend. After tonight's game in Columbus (7:35 p.m., BTN), the series moves outdoors to Progressive Field in Cleveland for Sunday's Frozen Diamond Faceoff (5:05 p.m., Fox Sports Plus). Michigan has been absolutely anemic on the the power play overall on the season, especially of late. The Wolverines are 42nd in the country with 14 power play goals in 90 opportunities (15.6 percent) and are 0-for-their-last-11. "It’s really been a work in progress, but there’s not a lot of progress," said Michigan coach Red Berenson after the Wolverines went 0-for-5 with an extra skater against Lake Superior State in two games. "You might have to change the name from power play to something else." The Wolverines' last power play goal came in the first period of a 4-2 win over Boston College on Dec. 29. Couple that with the fact that Ohio State is No. 8 in the country in the penalty kill and it doesn't add up to special teams goals for Michigan. The Buckeyes aren't exactly gang busters with an extra skater either, converting on 21 of their 102 opportunities, which is 21st in the nation. Michigan has been more vulnerable than Ohio State with a 36th-ranked penalty kill, but that should drop now that Jon Merrill is back from suspension. Michigan goaltender Shawn Hunwick didn't play the third period of Michigan's 4-2 win against Lake Superior State, didn't play in Saturday's 2-2 tie, didn't practice Monday and was a light participant on Tuesday. Hunwick finally returned as a full participant to practice on Wednesday and is pegged as the starter for both games over the weekend. "I feel good," Hunwick said after practice on Wednesday. "I'm just looking forward to getting back out there with the guys this weekend." The Wolverines will need him. Ohio State scored eight goals in two wins over the Wolverines when the teams played at Yost Ice Arena during Michigan's dreadful 1-6-1 month of November. It was the first Ohio State sweep in Ann Arbor since 1986. It's all old touque -- Canadian speak for winter hat -- for the Wolverines, who will be playing in their third outdoor venue in as many years. Though the Frozen Diamond Faceoff may include the first ice slide Michigan has ever played beside, the expected crowd of around 40,000 at Progressive will be the smallest the Wolverines have played in front of outdoors. Last year's Big Chill at the Big House drew 104,173 and 55,031 attended the Camp Randall Classic in Wisconsin. "It’s not going to be near the magic that we had last year," Berenson said. "They all kind of take on a life of their own, each one of (the outdoor games) is different. ... This will be a treat, but I'm not going to worry about it until Saturday." Berenson doesn't expect the elements -- the forecast calls for snow showers and 25 degree weather -- to faze his team either. "As cold as it's going to get was in Wisconsin, I mean that was cold, we were dressed. We had hand warmers and foot warmers and (long) underwear, you name it, and touques," Berenson said. "We'll be good to go, we've been through it before." Contact Pete Cunningham at petercunningham@annarbor.com or by phone at 734-623-2565. Follow him on Twitter @petcunningham. Fri, Jan 13, 2012 : 8:37 p.m.
Fri, Jan 13, 2012 : 8:02 p.m.
Is that a toboggan hill that they built behind the rink? That is absolutely awesome. Fri, Jan 13, 2012 : 8:20 p.m.